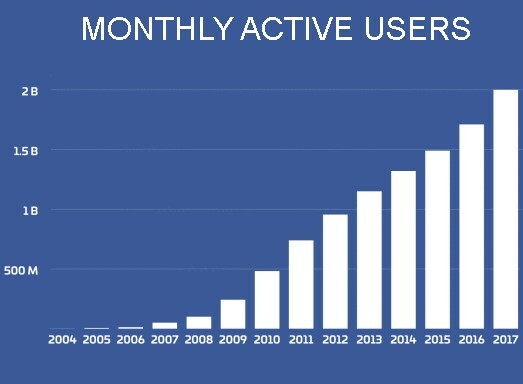 The meteoric rise of the number of active monthly users on Facebook (NASDAQ:FB) is nothing short of amazing. And when Mark Zuckerberg announced that Facebook has 2 billion monthly users, the company both appreciated the accomplishment, and the sense of responsibility that came with it. Facebook Has 2 Billion Monthly Users, But How Did They Get There? Facebook has a methodical approach driven with a broad mandate, which includes titles such as VP of social good in addition to growth, marketing, analytics, internationalization and other positions. The systems the company has in place is proven, and it is being used to increase the numbers of its other brands: Facebook Messenger, WhatsApp, and Instagram. These brands also have the largest monthly users in social media, with Facebook Messenger and WhatsApp at 1.2 billion and Instagram with 700 million. It took Facebook four years to hit 100 million users in 2008. The next milestone was half a billion in 2010, and one billion in 2012. And when the numbers seemed to be slowing down, it introduced Facebook Lite to make the platform more accessible in developing countries. In just two years the Lite version reached 200 million users. As Facebook looks to the next billion users, it reminded people why the platform is so popular in a news post. People use Facebook to connect with each other. Whether it is celebrating birthdays and Valentine’s Day or sharing community stories. And the company says it is pushing the positive force for good with facebook.com/goodaddsup and Facebook Communities Summit to connect more people no matter where they are. With every Facebook user connected to one another by an average of 3.57 degrees of separation, you can basically say Facebook has made it possible for 2 billion people to know each other. For marketers and small business owners, of course, Facebook’s size is important because of the number of potential customers — or partners or collaborators — you can reach with the network. But it’s also worth the effort to look at some of the ways Facebook has become such a powerful brand. The company filled a need — the need to connect — so basic that it is common to almost everyone. And it did so in a way that has never been done in quite the same before. It then made itself quickly indispensable, not just to its users, but to advertisers seeking to reach them. Small business owners would be wise to do the same. Facebook Reaches a New Milestone — Two Billion Users!